Our logistics team will process the RV Camper Motorhome or Trailer Parts or RV Accessories you've ordered quickly and efficiently using the latest shipping and parcel tracking technology. Wherever you are, choose from various shipping service levels to get your parts when you need them from two Canadian RV Parts Warehouses located in Ontario and Alberta. We can ship to your home, business, or even the RV campground or campsite where you are enjoying the outdoors. No matter what products you choose to save on with our low prices, pay with your choice of Visa, Mastercard or Paypal. We use industry-approved secure payment platforms and data encryption to protect your privacy and identity so you can shop with confidence. Plus, we use 128-bit SSL encryption technology to protect your confidential information. No matter what kind of motorhome, travel trailer, fifth wheel, or tent trailer you have, we have the products you need to maximize your outdoor lifestyle experience. From the largest available online selection of RV products we offer, to the world-class help and advice we provide RVers, to the efficient distribution of RV parts and accessories to your door; RV Part Shop is your best choice in RV outfitters! We know RVing. 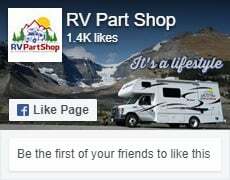 RV Part Shop was born because, as recreational vehicle owners, we recognized the need for an online store offering a comprehensive selection of RV parts and outdoor lifestyle products. We love the outdoors and the freedom and camaraderie offered by the RV lifestyle and we live to help you love it too. And don't worry about the year, make and model of your recreational vehicle, if the part you need is still available, we can find it for you. RV Parts and Accessories is not only our business, it's our focus and our passion. We don't have the competing priorities of RV sales or service like auto or RV retail dealers do, so we can offer you straight advice on what products will work for you so you can make informed purchasing decisions. We want to earn your long term business by being honest and helping you get the best value for your recreational dollar. Our buyers work hard to make sure we offer you the best prices, specials and deals on RV parts. Plus, we'll get you your parts and accessories in a timely manner, and save you driving a long way to get them. You can even read reviews here for selected products to find out how other RVers felt about their purchases.